Online card games are in almost every way, absolutely identical to their land-based counterparts. 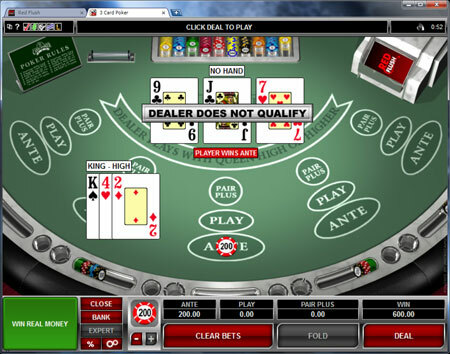 It is a common misconception that online casino card games, are rigged by the computer, and that it is impossible to win, because the computer refuses to allow the gamer a good hand. This is absolute nonsense, and often, nothing more than a cry from the anti-gambling community, in an attempt to have online gambling banned. The truth about online card games is this. Card games, after progressive jackpot slots, are amongst the most popular games on the internet. Any tampering with the fairness and legitimacy of gamers winnings would be easily fished out, and there wouldn't be so many players found across the globe, in practically every major country, playing. Amongst the favourites is poker, which is mainly run from online poker sites specialising in the game, rather than online casinos who generally offer a video version of the game instead (video poker), and of course, blackjack. Blackjack can be found across the internet, in poker sites, online casinos, bingo sites, and even on the odd occasion, sites entirely devoted to the game of online blackjack. Other popular online casino card games are: Cyberstud poker, pai gow poker, three card poker (including multi-hand version) and casino war. Online poker sites generally house several variants of classic game of luck. Texas Hold'Em and 5 Card Stud can often be found on the sites, along with tips and hints, strategies and tutorials for new gamers, to ensure that both amateurs and pros can keep themselves in the loop about the latest developments in the game. For gamers unused to the format of each varying poker style, winning combination charts are also frequently available to assist them. Online blackjack sites, though rarer, offer almost exactly the same thing as their poker cousins. Blackjack is so popular; there are often news sites entirely devoted to bringing gamers the latest from the blackjack world, and many more sites that offer tactical advice on the card game. Though just what tactical advice you could possibly wish to take in a simple game that requires you to make Blackjack (21) is comical. Other less common online card games seldom found online include bridge, multi-hand 3 card poker and solitaire. Though the latter is almost never playable for real money when found online at all. In actuality, you really have to travel far and wide across the net to find too many online casinos that offer these increasingly rare card games. Whether you are after winning some serious dosh, or even if you just fancy a flutter with free play cards, and no deposit required; the internet is full of poker sites, and online casinos that house both types of gaming schemes, and plenty of card games, in both table and video platforms. With all the strategy guides out there too, the internet is a wonderful place to learn, to keep a good hold of your hand, and practice your poker face.